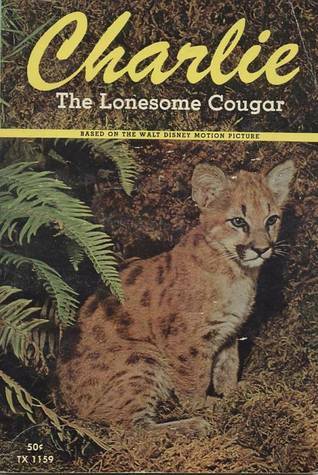 I have been packing around a paperback copy of Charlie the Lonesome Cougar for almost 50 years now. The title is from a Disney movie that came out in 1967. I may have watched the movie on a Sunday evening “Wonderful World of Disney.” Perhaps at a drive-in theater! In 1968, Scholastic Books published a book based on the screenplay. I loved getting those Scholastic book orders every month or so, and I loved books about animals. The book is only 78 pages long. I probably paid a precious quarter for it. When the book came to mind recently, I wondered if I should risk ruining it for myself by reading it again. My desire to know whether it is good stuff or junk was stronger than my wish to let the book and movie remain pleasant memories. My conclusion about the book is that it’s sweet and wholesome. The story is light with plenty of humor. 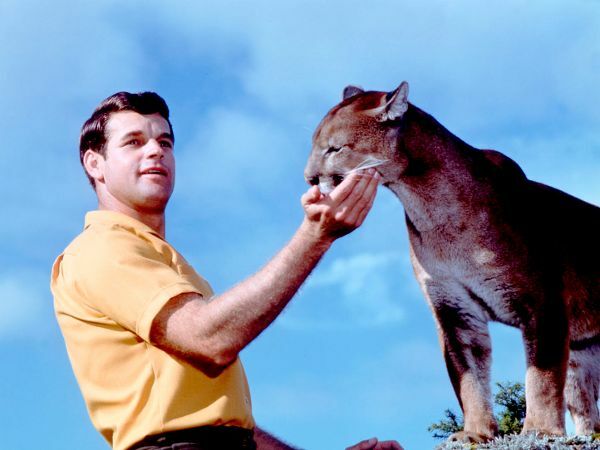 Animal-loving children can enjoy imagining having a cougar for a pet. Adults will be aware that that can come to no good, but will fall in love with Charlie anyway. Jess is a young man who works for a lumber company in the Pacific Northwest. One day, while out marking trees in the woods, he discovers a tiny cougar kitten that has somehow been abandoned outside the den. The baby’s eyes aren’t even open yet. Who could leave the helpless kitty there to starve? Mark Van Cleefe, the author who converted the screenplay to book form, writes some endearing descriptions of the kitten learning about his world. Everything is new to Charlie, the cougar. A blowing leaf crumbles under his paw, a fuzzy dandelion makes him sneeze. If he hadn’t tumbled down the hill when coming face-to-face with a growling badger, that encounter could have ended badly. When he starts a game of tag with a squirrel, he gets himself stuck in a tree and Jess has to rescue him. Van Cleefe also periodically reports on Charlie’s age and growth so we get a picture of how quickly he grows into a huge cat. At two years old he is 7 feet long and weighs over 160 pounds. Charlie is no longer a housecat. The best parts of the story are when Charlie roams in the wild. Charlie’s interactions with the lumber men have more of a feel of set-ups for short, funny, or heart-racing scenes that build toward the inevitable parting of the man and the wild animal. When Charlie accidentally wanders off into the wilderness, we see him face the challenge of surviving on his own. He has to become a wild cougar rather than a pet that takes his daily food for granted. We see how much of the life of a wild animal is taken up with self-defense and finding food. For children who may not yet be interested in studying animals, I think his encounters with other creatures could open a door of investigation. With great interest, Charlie watches as a bear catches fish. He doesn’t learn how to fish for himself, but he becomes adept at stealing fish from the bear. Then the bear moves on and Charlie is on his own again. The lumber company Jess works for floats logs down the river to the mill. A floating bunkhouse and kitchen raft follow. Charlie accidentally sets the kitchen raft free of its mooring with Jess asleep inside. The raft drifts into a log jam where the men have just lit a fuse for the dynamite set to break up the jam. Charlie rides a log down the river, disembarks onto the log jam, and picks up the dynamite, attracted to it by the long “string” attached. Will he respond in time to Jess’s hollering for him to drop it? Of course he will. It’s Disney. Everything is going to be fine. But chaos and much damage will ensue. It is the company manager who finally tells Jess that he will have to stop bringing Charlie to work. So, Jess has to cage his cat. One night Charlie scents another cat, a female. He escapes, goes for a romp, can’t find his way home, and spends the winter learning to fend for himself in the wild. When he finds his way back to the lumber camp the next spring, there is more chaos in the camp and everyone thinks Charlie has gone bad. Jess shows up just as the manager is about to shoot the cornered cat. I remember this scene being very intense when I was a child, but it isn’t drawn out too long, and it is very satisfying when Charlie remembers Jess and lets himself be led out of danger. The next day, Jess takes Charlie to a wildlife refuge where he sets the cat free to live happily ever after. Charlie meets up with his girlfriend and they amble off into the sunset. The scenario will sound familiar to lovers of such stories as Gentle Ben and Rascal. Though the pet will be missed for a long time, the wild animal really will be happier in the wild. I was concerned that the movie I loved as a child would seem silly now; a string of slapstick situations with a giant cat living out of his natural element. It was not. 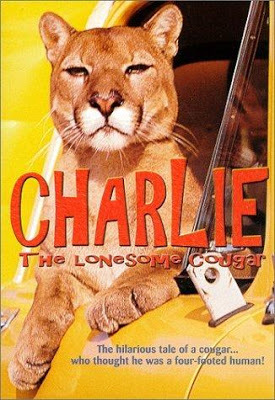 The scenes of confrontation between cat and man’s world might seem a bit contrived to movie-savvy adults, but it turns out that most of the time is spent showing Charlie in the wild. The thin plot almost seems more of an excuse to follow a cougar around with a camera than a real attempt to show what life would be like with a gigantic housecat. Animal experts may find plenty of diversions from the realm of possibility, but I find the nature scenes wholesome and lovely. There is an extended scene near the beginning where Charlie has wandered off to survey his neighborhood. He encounters a raccoon cub, a fox kit, and a young pine marten. Then he plays with a bear cub until the sow has to rescue Charlie and her cub from a male bear. Mama wins the fight with the male when Charlie and the cub break the tree branch from which they’ve been watching the battle and land on the male bear’s head. It’s a bit silly, but mostly fun, and the scene with Charlie and the cub napping together in a hollow log is darling. Charlie’s foray into the wild after becoming lost in the wilderness is a large chunk of the movie. It is more like one of Disney’s nature films than a regular movie. Charlie and the female cougar romp and slide in the snow. Charlie roams through some stunning scenery. As Charlie has never had to hunt for food, he has to learn by watching other animals. When the female cougar catches a rabbit, he expects her to share. She does not. The rabbit killing is done off scene, as is the killing of a deer later, once Charlie becomes an accomplished hunter. My dad and his dad were loggers in Oregon, so I enjoyed watching the lumber company prepare for the spring log drive down the river. They are shown breaking up log jams, the narrator explains how the cookhouse raft and bunkhouse raft (wanigans) follow the lumberjacks, and there is a short birling competition which Charlie joins. When Charlie is chased by a bounty hunter with his dogs, Charlie escapes by doing a log-riding trick from his kittenhood, this time down a flume. I am quite pleased that I can recommend this book and the movie for children of any age.